Missing from the pic are the gorgeous rainbow paper chains that are hanging above the display but I couldn’t fit them in. Anyway, the rain cleared away, the sun shone, the parade, erm, paraded, and all was good. 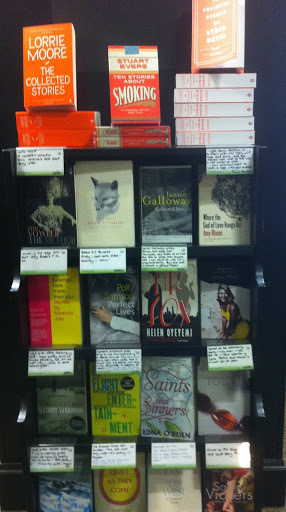 See how pleasingly orange the top shelf is, look at how scrumptious Ten Stories About Smoking by Stuart Evers is. And yes, that is Lydia Davis finally available in paperback! Previous Post Cindytalk "Hold Everything Dear"
Sounds such fun – one of these days I'll get there. 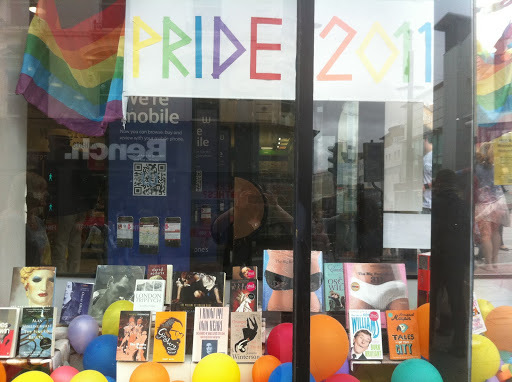 Lovely lovely – the window and your display case! Your short story display makes me happy on a day when I'm feeling particularly depressed about being a short story writer. I love the cover with the fox – what book is that?Very colourful and fab for a wonderful day. S – Radio 4 was just the last (or latest) straw for me, general bah seems to sum it up. Bless you, Sara Crowley, for being such a good friend to the short story for so long with your super-special short story stands.Every Waterstones should have a Sara Crowley. Breece Pancake is one of my favorite authors. I used to handsell that book like mad to anyone who'd take it during my ten-year stint as a bookseller. I think I sold something like 200 copies over the years.Your shop looks wonderful and fun to work in.